Keeraithandu Kuzhambu, I am not sure, how many of you heard of this recipe. Generally, when ever we buy any green vegetable(Keerai), we pick the leaves and discard its stem. This recipe is to use the stem which we discard to prepare kuzhambu. I have used the stems of sirukeerai but you can also use stem of thandu keerai. Just discard the root portion and use the stem for this recipe. This will give a change to your regular varieties of greens that you make, so next time when you buy greens don't waste the stems. Toor Dal - 1 tbsp. 1. 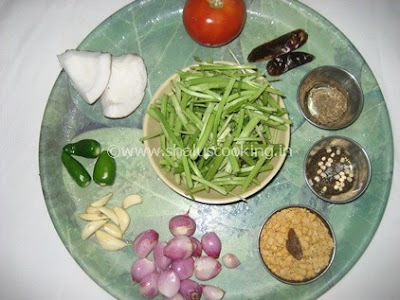 Keep all the ingredients ready for making Keeraithandu Kuzhambu. a. Cut the stems of greens to 2 inch pieces. b. Peel and wash shallots and garlic. c. Roughly chop the tomato. 2. Pressure cook the toor dal with cumin seeds, garlic cloves, shallots, green chili and turmeric powder. 3. Boil water in a pan and add keerai thandu, shallots, garlic and a green chili to it. Allow it to cook for about 6 to 8 minutes and check if it is cooked or not. Once it is cooked, add roughly chopped tomatoes. 4. Add required salt and mix well. Allow it to cook till the tomatoes become soft. Now add the cooked dal and mix well. 5. Take a blender and add coconut, 4 garlic cloves, 3 shallots, 2 dry red chilies and cumin seeds. Grind it to a fine paste and add it to the curry. 6. Temper using the ingredients listed under "To Temper" section and add it to the curry. Healthy and tasty Keeraithandu Kuzhambu is ready to serve with hot steamed rice with any side dish of your choice.